Jose F. Colon, MD is Medical Director of the Rehabilitation Medicine Center of New York in New York, NY. He is also Medical Director and President of the Newark Rehabilitation Center in Newark, NJ and Partner in Rehabilitation Medicine Associates in West Orange, NJ. He is licensed to practice medicine and surgery in the states of New Jersey and New York. His areas of expertise are rehabilitative medicine and pain management. Dr. Colon is Board Certified by two prestigious medical organizations; the American Academy of Pain Management and American Board of Forensic Examiners. He is licensed by the National Board of Medical Examiners, The State Board of Medical Examiners of New Jersey, and The State Board of Medical Examiners of New York. Dr. Colon performs independent medical examinations for insurance carriers. Insurance companies rely on Dr. Colon’s expertise and medical opinions. 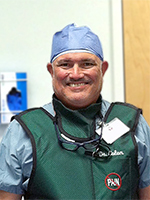 Dr. Colon graduated from Rutgers University with Bachelors of Art and received his Medical Degree at University of Medicine and Dentistry of New Jersey. He completed postdoctoral training at Saint Michael’s Medical Center in Newark and St. Vincent’s Medical Center in New York City. He is an active member of several prominent associations, including the American Society of Interventional Pain Physicians, American Academy of Pain Management, Reflex Sympathetic Dystrophy Syndrome Association, North American Neuromodulation Society, International Neuromodulation Society, American College of Occupational and Environmental Medicine, National Association of Disability Evaluating Physicians, American Medical Association, New York County Medical Society, Medical Society of the State of New York.